In case you haven’t noticed I haven’t been doing a lot of posting lately. I don’t know why. Most days I just don’t want to. And I can’t think of anything to say. I know I used to post every single day- what in the world did I talk about? For some reason these days when I have few minutes free I want to get on Facebook rather than my blog. But I thought it was time for an update. A few weeks ago when we went to look at houses again we didn’t find anything we wanted. So since it had been a few weeks since we put an offer on the first house we liked, and that house was still available, we decided to put in another offer. We went a little higher than we did the first time- and the sellers came down a little from the price they were stuck at before and we found an amount we agreed on. Since we are closing on our house that we currently own weeks before we’ll be able to move into the new house we are going to be staying with my parents for a couple of weeks and storing our stuff in their garage. So, 2 weeks ago when we went back to have the inspection done we decided to rent a medium sized truck and move part of our stuff to get some of the move done ahead of time. 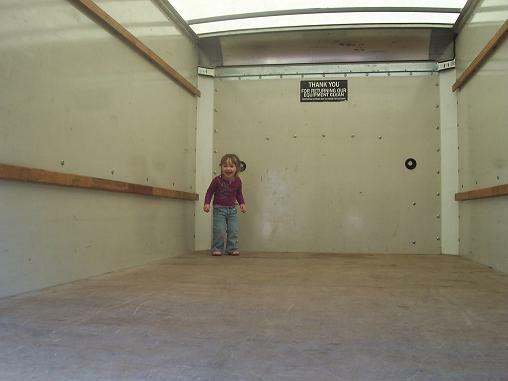 Hailey was thrilled to see “the big lellow truck” in the driveway. 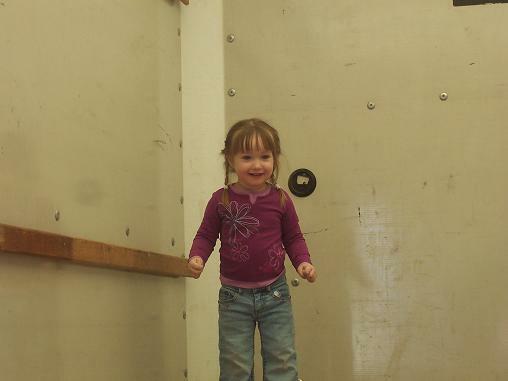 And even more thrilled when she got to jump around in the back of the truck. 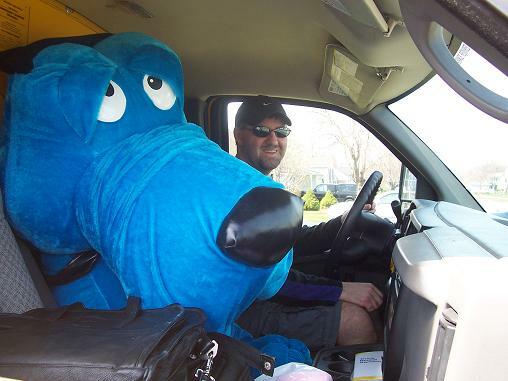 Here is Rich with his lovely big blue dog that he won several years ago at an amusement park. I was really hoping the dog would not be making the move with us- so imagine my surprise when I saw where the dog was riding. The inspection went well- the house is in good condition. Now we are just waiting for everything else to go through smoothly. This weekend we will be moving out of our house and staying with my parents while we wait for the closing on the new house. So I am busy this week working on packing up the rest of our house. And also busy worrying about the swine flu. What have you been up to? Great news about the house! Well not worrying about the swine flu….I’ll leave that one up to God. And how cool about the house! I can’t wait to see pictures and see ya’ll all settled in. You’ll be glad you got some stuff out and moved in advance…less stress in the end. Hailey looks like she is excited and having fun….oh for the eyes of a child! I pray you see how God is moving…or how He is arranging. He is at work…..He might even step in and do a little something special if you talk to Him about that big blue dog. I’d rather be on facebook too. I’m addicted to that site. I have writers block lately when it comes to blogging too. Yippie! You finally found a new house. I bet you’re so relieved. Yes, I’m worried about the swine flu too. We just had our first two suspected cases this week in Michigan. Such scary stuff. Makes me want to hide in my house and never leave. LOL! Good luck with the move. Thanks for your sweet comment on my blog. Take care. I’m in the sae bloggy funk – so don’t feel bad there. Glad you can stay with your parents while you wait for your house closing. I can’t wait to see pics and get updates on the new house! Hailey looks adorable in the truck!! Hope everything goes smoothly with your move and your new house!!!! Wonderful news about the house.. good luck with the move. Yay on the house! And I LOVE the dog in the truck – how fun! Good luck with the move!! I LOVE that dog shot and enjoy the time away from the blog. I’m so happy you were able to get the house you first wanted. I guess I didn’t realize it was the same one. After some of the houses we looked at with your parents, well…… so glad it worked out! About the dog and Rich, which one is Rich? love ya Rich!